Selling is part of everything successful. When you are a business, you need to sell your product or services. When you are a CFO, you need to sell you departments’ capabilities so that you can move from reporting to strategic partners. When you are an employee, you need to sell your skill set to get on that project. In any of these situations, you need to know how to sell your solution as the best and only answer at any price. In any of these situations, the approach should always be to focus on identifying and solving a specific problem. If you can get the customer to spend enough time talking about their pain, then you can position yourself or your services as the solution to that painful problem. We’ll discuss two psychological principles that this method utilizes: Anchoring and Congruent Attitudes. When you are talking with a customer or with a new potential manager, you want to focus on how big of a problem you can solve for them. If you can get the focus on the largeness of a problem, then any costs associated with solving that problem are perceived as smaller due to a phenomenon known as price anchoring. This phenomenon has been proven in many scientific studies. People are not logical when determining the value of a product, and cannot overcome price anchoring, even if they are aware of the fact that price anchoring has occurred. So let’s take advantage of that fact and anchor the value of our products and services to the largest number possible. When going through these steps, it is important that you gain agreement at each phase before moving to the next phase. If you don’t take the time to gain agreement in each phase, the subsequent steps become less powerful and less convincing. There is also a psychological phenomenon occurring here called congruent attitudes which means that if someone has agreed with you several times before, they want to continue agreeing with you in subsequent steps. Make the customer identify and specify the problem they want to be solved. This does several things, it gets the customer focused on the emotional pain and stress associated with the problem, it sets their focus on the magnitude of the problem before they focus on the magnitude of your price. And, it allows you to see their pain point so that you can position your skills as the solution to that problem. Your product, service or skillset inevitably solves tens or hundreds of problems, but if you don’t know what specific problem your customer wants to solve, then how will you know which skillset to highlight? This step is absolutely critical. I have seen way too many people and companies focus on selling their skills, capabilities, and features first. This features-first approach forces your customer to identify the value of your products on their own in their mind. That is a mistake. Customers don’t care about your features, they only care if your features will solve their problem. Features-first is very self-centered and somewhat narcissistic if you think about it. How Much Does the Problem Cost Your Customer? If you can identify how much the problem is costing your customer every year, you will now understand how much money is on the table. This step not only identifies the pain of the customer but quantifies how much it’s costing them every year. If you know that your customer pain is costing $300 Million per year, you’re not going to charge $1k per month for a solution to that problem. This is the foundation of a good Value-Based Pricing approach. 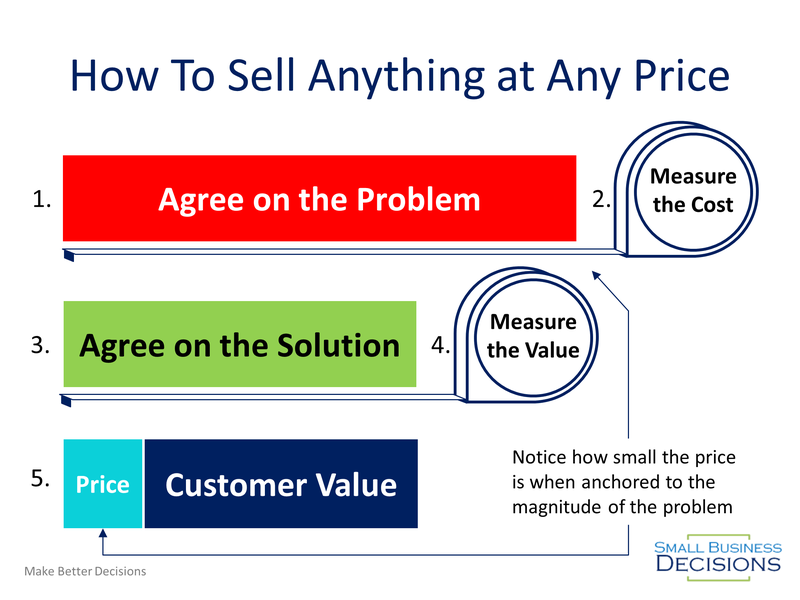 You want to spend time here, if you can get your customer to agree to your analysis on the cost of the problem, you’ve now anchored the discussion on the highest possible value for anything you do with that customer. This also gives you true insights into the customer process and what costs you can associate your pricing with. If you are dealing with consumers and smaller tickets, you may just need to present this value to them as an average. What is the Agreed Upon Solution to the Problem? Now that we’ve spent enough time defining the problem, we can focus on how your product, service or skillset solves that problem. If you have done enough homework defining the problem, this step should be fairly straightforward. Get specific. State how your solution specifically solves your customer’s problem. Your product probably solves more problems for them than you’re discussing, you can show those, but keep the focus on the specific problem they agreed with you that they have. It is critical that the customer says that they agree that you have the solution to their problem (remember, congruent attitudes are powerful). What is the Value of Your Solution? Once you get agreement on the solution to the problem, It’s time to quantify the customer value of your solution. This means you can say, with confidence, that the solution they agreed to will cover some percentage of the agreed-upon cost of the problem. For the $300 Million per year example, we used earlier, you can say that your solution will reduce that cost by 20%, which means your solution will create $60 Million per year in value for the customer. If you can say that your product solves 100% of that problem, even better. Now that we’ve gotten the customer to agree on all of the steps above, you can position your services as a free money printer. I can create $42 Million in value for you, that’s $60 million in savings after you subtract my $18 Million fee. See how I did that? $18 Million seems like a HUGE fee if you throw it out there first, but because we’ve already talked about the $300 Million dollar problem and the $60 Million in savings, $18 Million doesn’t seem that high. Another example is in consulting. If I can help you win $4 Million in new business in six months, a consulting fee of $250 k, or $250 an hour doesn’t seem ridiculous anymore. I just created $3.75 Million in free money for you without having to sell it. Same goes for salary or budget negotiations.